Southern Thailand is home to a large Muslim population. I have read that Narathiwat, Pattani and Yala provinces in the deep south near to Malaysia have more mosques than temples. Tourists visting Phuket and Krabi provinces will see lots of local Muslims and mosques. 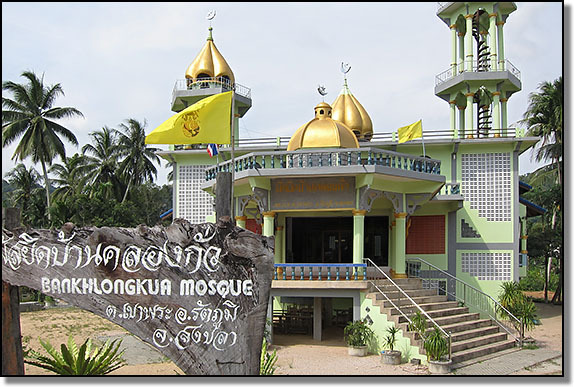 You will also find plenty of mosques in other southern provinces, especially Satun and Songkhla. The mosques in Hat Yai are quite varied in style, from small places of worship that also act as schools to the large, imposing Central Songkhla Mosque, which is located on the 'new' road that runs between Hat Yai and Songkhla. The following listings just give some very basic information. If you have any information about any of the places of worship listed here, I would be very happy to add it. You can contact me by sending an e-mail. Comments: As you drive out through Hat Yai Nai towards the airport, this mosque is located just before the junction where you turn left for the airport. Comments: This small mosque is located at the end of a Soi near Hat Yai hospital and the President Hotel. There is a sign on the main road to help people find it. Comments: I have always found the people at this mosque to be very friendly. That isn't always the case. While looking around a mosque in Nakhon Sri Thammarat one time, I was told very impolitely to get out. Many Muslims at the Pakistani mosque do actually come from Pakistan. It's located in the same area as the fresh market very close to the Hatyai Holiday Hotel. Comments: Due to its sheer scale this is quite an impressive building. It is located on the 'new' road between Hat Yai and Songkhla. Despite the considerable distance, it is easily visible from the Prince of Songkla University and up close it is even more impressive. The mosque is set in a very quiet and peaceful location. Surrounded by open fields, it is close to the large canals that form part of Hat Yai's flood defence system draining rain water away from the city into Songkhla Lake. Cool, pleasant breezes blow through the mosque giving a little respite to the intense heat that is typical in southern Thailand. It is quite isolated and there is plenty of space to park cars. I would imagine that on Fridays and Muslim holidays the mosque gets very busy. Many Muslims from other provinces make a point of visiting the mosque if they are in Songkhla province. The mosque doesn't appear to have a name. When I asked, I was told, "mus-yit glaang jungwut songklaa" - Songkhla province central mosque.